At times I’m tempted to do a Depardieu. It’s not the 75% tax rate that hurts . I’m a high minded individual who likes to pay his dues to society, keep the health service ticking over and all those retirement-gazing government officials in their overpaid jobs. No, it’s the small things that get to you in the end, like the mark-up on wine in a restaurant. better to pay taxes than live out the rest of your life there. Part of the reason I’ve stayed in France is the delight in discovering places like the Cave des Alpilles in Fontvieille. I came upon it quite back accident. A friend had suggested I review the Bistro Marine in Maussane Les Alpilles, a new fish restaurant, aiming to bring a splash of urban sophistication to this charming village. I was early and wandered in to choose my table. The lights were off, a whiff of seafood hung in the air, and the feel of the place was about as cosy as my local tax inspector’s office. I moved on, ambling up the street poking my nose into little restaurants and shops, ending up in a wine merchant called the Cave les Alpilles. The selection of wines was excellent, with good coverage locally and regionally. I bought a Domaine de Morderee Lirac, and was pointed in the direction of the mother ship, a shop/tapas restaurant with a stock over 1,000 wines in nearby Fontvieille. 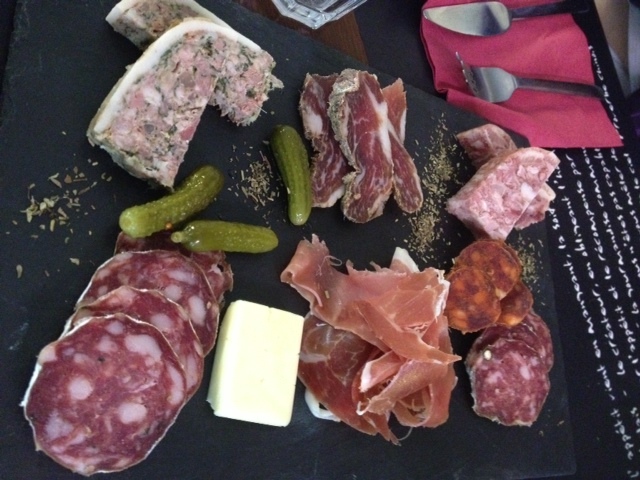 I was hungry and had never been to Fontvieille. I reasoned, that not being in Belgium, it had to be better than Nechin. The principle behind eating at Cave les Alpilles is that no mark-up is charged on the wine, only a corkage fee of 6 euros, which remains constant regardless of the price of the bottle. A similar concept has been tried successfully by the Brinkleys chain of restaurants in London, a company that has proved that if the wine is good and cheap, it scarcely matters what you put on the plate, the punters will come. In distant Fontvieille I embodied this concept. Tapas belongs on a beach in Spain not on a lunch time plate in the south of France. Yet there I was feeling mildly disappointed, gazing down a menu of dishes that included roasted peppers and marinated sardines. As I always do in these situations I looked around to see what other people were eating. On the table next door two men were busy discussing a vineyard purchase. They’d each opted for the special of the day oysters from the local market, 12 each and a bottle of white. They looked mighty happy about life. Further away was a table of older customers. The ladies had chosen a salmon tart, and the men a daube de taureau served with pasta. It was hard, though, to avoid the feeling that the food was almost incidental. All around the restaurant diners were holding their wine glasses up to the light, studying the luminosity, and viscosity, before reverentially sipping. Laurent, the owner, took my order, offered me a choice of wine by the glass or the opportunity to select a bottle from the cellar. Down the spiral stone steps I went to an area that felt twice the size of the restaurant overhead. The ceiling was domed like a cave and to move between the different areas I had to duck my head. Set into the walls were the promised thousand bottles of wine. The first feeling was bewilderment, how could I possibly choose from such an extensive selection. At least with a wine list one can usually eliminate 90% of the bottles, as either unsuitable in terms of price, or a mismatch with the chosen food. In the Cave des Alpilles, you don’t simply run your fingers down a printed list, you walk between areas allocated to specific wine regions, pull bottles from their cases, feel the weight of the glass, study the labels and imagine the man that made the wine. Doing so is confusing. I suddenly wanted everything, like a kid in a sweet shop sweating over how to spend the last pennies in his pocket. Slightly dizzy I went back upstairs. l composed myself and asked Laurent to select the wines to accompany the oysters and daube and for his caviste to pack me a selection of 24 bottles to take away. Having low expectations of the food is the best way to eat. Michelin places are inevitably a disappointment, all the fancy language, and cushions as puffed up as the egos of the chefs. Most of the diners appear bewildered. It’s only food after all. And it doesn’t come much better than 12 oysters with an ice cold local white and expertly cooked daube de taureau – apparently the secret is to vigorously boil the stew on the hob to break down the tough sinews in the meat. Laurent explained that his aim was to offer a small daily menu of high quality food, and also tapas for those who came mainly for a drink. The concept is working, and Laurent now plans to expand the sister shop in Mausanne to also offer food. 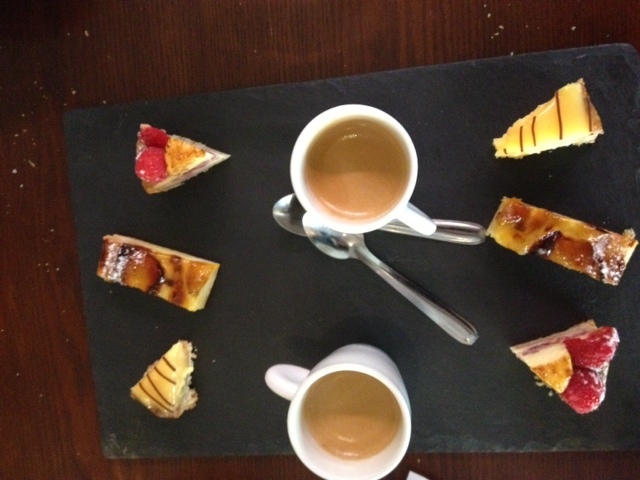 Dessert was a coffee with a selection of local patisseries, all included in the price of 13 euros 50 (oysters on top!). 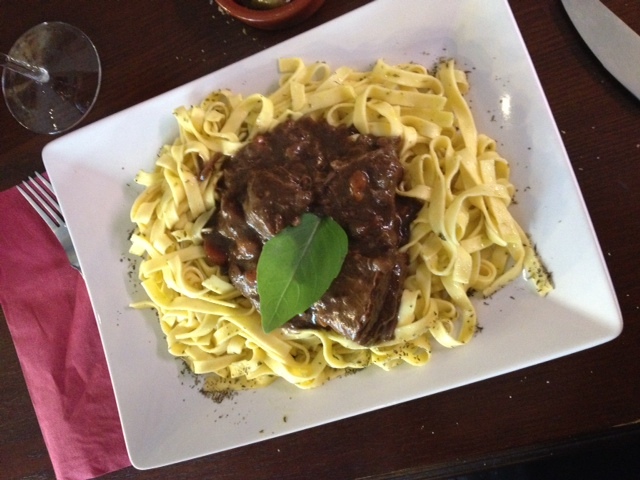 The Minervois was 18 euros, and Laurent was right, it accompanied the daube perfectly. In any other restaurant I would have paid over 30 euros for the same wine. And the moral of this story is that even the rich feel good about saving money, but not when it comes to taxes Mr Depardieu, we should all pay those.